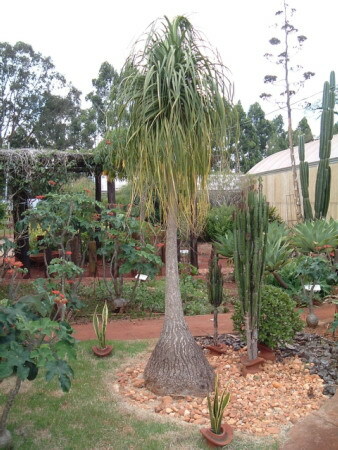 Beaucarnea recurvata (often called the ponytail palm in English, even though it is not a true palm) is a species of Beaucarnea often grown as a houseplant in temperate latitudes. Successful cultivation requires winter minimum temperatures of above 10 °C, rising to around 30 °C in summer. Beaucarnea recurvata needs full sun to light shade, with a well drained soil mix. A soil mix consisting of 2 parts loam to 1 part peat moss to 2 parts sand has been used successfully. To this mix, small gravel may be added to ensure good drainage. In a container, plants are very slow growing and very drought tolerant. Plants can be watered every three weeks during the growing season and fertilized once during this period. During the winter months, the plants should be watered only enough to keep the foliage from wilting (this usually equates to 1 dose of water during the winter). Over-watering is the single most frequent cause of failure when growing Beaucarnea. The ponytail palm is a very slow growing tree. If you break off one of the branch "crowns", new growth will appear in about a month.